Obama at a King Day rally at the state capitol in Columbia, South Carolina. Senator Barack Obama will accept his party’s nomination for President on August 28, the forty-fifth anniversary of Martin Luther King Jr.’s “I Have a Dream” speech. The punditry that will follow is likely to be more self-congratulatory–the achievement of King’s dream–than historical analysis of what has taken place. Already we’re in hype-mode. Obama will give his speech before more than 75,000 people in Denver’s Invesco Field, home of the Broncos, as billions more watch on television around the world. Media analysts will likely summon up images of Reverend King delivering his celebrated speech in 1963, which will fade to Obama giving another historic speech in 2008. Obama has not been shy about encouraging Americans to associate him with Martin Luther King Jr. and the modern civil rights movement. Although the two men signify how much our world has changed in forty-five years, there are manifest differences between them that are worth recognizing. At times, Obama evokes a Christianity that in this day and age resonates more with the conservative Southern black Baptist theology of Martin Luther King Sr., rather than the younger King’s modern liberal theology that extolled a gospel of social equality. Much has been written about Obama and his faith claims. He was raised in a polyglot of secularism. His maternal grandparents were non-practicing Baptists and Methodists and his stepfather has been described as a “nominal Muslim.” Obama joined Reverend Jeremiah Wright’s Trinity United Church of Christ when he was in his 30s for largely political reasons. His hyper-Christianity has been attributed to his effort to reassure voters that he is 100 percent “American,” and to counteract some peoples’ narrow-minded belief that his foreign-sounding name and his forebears’ Muslim history are evidence that he is an outsider and therefore not qualified to be President. When Obama evokes Jesus before some audiences, especially in the South, it is not clear whether we are witnessing calculated opportunism or that he has not examined the way mainstream Protestant theology has changed over time. In some ways, he more resembles King’s father than he does the more famous King who dared to dream. Although he was not a beneficiary of federal funds for any project, King Sr. would have had no trouble embracing the Faith-Based and Community Initiatives that President Bush started and Obama has promised to support. The elder King grew up in a world in which black Southerners were excluded from the larger civic and political spheres. The only institutions they controlled were their churches. And their churches performed like political theocratic governments, monitoring the sacred and secular behavior of their members, bringing transgressors to church courts and punishing those who fell out of line. In King Sr.’s world, churches were still the dominant institutions in black communities, exercising all manner of civil authority. Not only would he have been comfortable with faith-based initiatives, the idea of secular civil government being responsible for social programs would have been anathema. By the time King Jr. came of age, the social conditions in the South had changed, propelling transformations inside the churches and the churches’ relationships with their respective communities. Unlike his father, who was a Christian Nationalist, the younger King was part of the new generation of civil rights activists, more outwardly focused and demanding full citizenship. As agents for modernity, they made a separation between church life and civil society. Already the courts had moved away from churches and from enforcing biblical injunction and social behavior in secular society, where laws are passed by a secular legislature and interpreted by a secular judiciary. King and his fellow protesters demanded that government fulfill its promise of democracy for all. I’m not sure King would have been comfortable with Obama’s expanded view of faith-based initiatives, which allows for churches to design social programs and make decisions about who has access to them. Given all that we know about the leadership of the civil rights movement–King and Ralph Abernathy and their Southern Christian Leadership Conference–it makes sense that we would understand black religion and black churches as immutably political. While studying the churches and their relationships to their respective communities in an earlier era, I was astonished to discover how wrong this assumption is. At the eve of the movement, the institutional primacy of the churches was giving way to a more diversified secular sphere, a necessary precondition before an overtly politicized movement for freedom and democracy using churches as staging areas could take place. The unambiguously political movement of the 1950s and 1960s that drew on many principles of Christianity and radiated from many, although by no means all, black churches was possible only when churches came to exert less control over members’ daily lives. It was not until the churches become less insular and more outwardly focused that they would become settings from which to wage political struggles. There was something medieval about both presidential candidates’ recent appearance with Rick Warren at his Saddleback Church in Orange County, California, on August 16 to talk about a range of personal issues (disguised as “social issues”) with “faith” at the top of the list. Obama, already polling relatively well among those voters who count themselves as religious, wants the evangelical vote too. Whether he managed to make inroads there is not yet clear. What is clear is that with Obama’s participation, Rick Warren was the big winner in the Saddleback Church event. Warren is now one step closer to achieving his dream of putting God before politics. The bond between evangelical Christianity and the Republican Party has effectively been severed. Aside from the political implication of the principle of “God First”–the meaning of which has always been open to interpretation–Obama’s eagerness to embrace Warren’s political stance (disguised as politically neutral) would have given comfort to the theologically and socially conservative Martin Luther King Sr. and members of his generation, many of whom opposed the explicitly political civil rights activism of Martin Luther King Jr. The pre-civil rights movement generation of black lay and ordained church leaders put God and faith claims before anything else because they were excluded from larger secular civil society. Obama’s reasons for appearing with Rick Warren and discussing the details of his Christian faith probably have more to do with political opportunism than anything else. 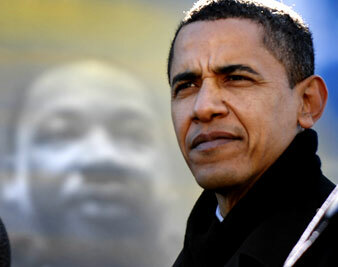 No one would disagree that Obama is a beneficiary of the civil rights movement. Nor should anyone argue that the movement would pave the way for only one sort of black leader. So when we watch the political extravaganza in Denver, let us understand that for all the obvious symmetries, Obama does not walk quite so much of the walk–nor talk so much of the talk–of the man who gave that famous speech forty five years ago.